This lotion is made of powerful multivitamins, antioxidants and minerals from Malunggay, Olive oil and Omega (sunflower oil) to rejuvenate the skin in a gentle process. Before we proceed with the review, take a look first on how those ingredients of this lotion help our skin. Malunggay. Antioxidants and nutrients that are present in Moringa oil help curb the activity of free radicals on the skin. It also contains antiseptic and anti-inflammatory properties and has a good moisturizing property because it is high in Vitamins A and C.
Olive oil. Being high in Vitamins A and E, this oil works as cleanser, moisturizer and protector of skin. It is also rich in antioxidants that penetrate deeply into the skin to neutralize free radicals without clogging the pores. Omega (sunflower oil). This is high in Vitamins A, C, D and E which are crucial in the prevention of damage to sensitive skin cells by ultraviolet light and in providing protective barrier on the skin. Deeply nourishes and moisturizes dry skin. Smoothens and softens dry, scaly skin. Stimulates cell regeneration and skin renewal. Improves skin elasticity and suppleness. Helps slow down signs of aging. That's a lot, right? But, does it live up to its promise? Let's see! Rating (out of 5stars): ☆☆☆☆ | It's just the typical container used by other lotion manufacturers---plastic lotion bottle with oval top cap. It's easy to open but in my opinion, it could have been better if they used pump types. The labels, both in front and back, provides the needed information in clear text. Expiration date is also clearly indicated on the bottom part of the bottle. Rating (out of 5stars): ☆☆☆☆ | It smells like green tea! It didn't irritate my nostrils because the scent is light; very soothing and calming in fact. It won't interfere in your perfume if you're wearing one. However, the green tea scent doesn't last that long. Rating (out of 5stars): ☆☆☆ | It is quickly absorbed by the skin. And when I say quickly, I mean really QUICKLY! No greasy feel after application. The downside though is this: it needs frequent re-application because its moisturizing effect doesn't last very long. Say, 4 hours? :) I am not really sure though if it's just because of the type of my skin---so, you better try it yourself! On smoothening effect, it really does make your skin soft and also helps in relieving itch! 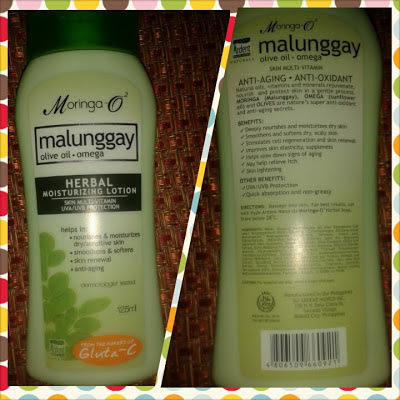 Rating (out of 5stars): ☆☆☆☆☆ | Moringa-O2 Malunggay Herbal Moisturizing Lotion is really cheap! It's sold at PHP 129.75 for 125ml---that's a good catch without compromising the quality. It could last for a month if you're the only one using it. That's pretty affordable, right? Overall, I give ☆☆☆☆☆ because I really like this product! It's not masaket sa bulsa and I'll definitely re-purchase if I see it inside malls (or anywhere else). It's not sticky, really. Perfect for any type of weather we have! If you haven't tried this lotion yet and you wanted to, Sample Room is re-stocking it every now and then. So malunggay is now making some noise in the field of herbal medicine. I have seen many forms of malunggay in SM HyperMarket mostly sold as power and tea. good to know that there is a malunggay product that can be associated to beauty things. Organic based products are really better and this time, they have now discovered Malunnggay can also be a good lotion. hmmm, this malunggay lotion sounds great! May whitening effect din ba to? How I wish I can use any moisturizing product available like this Malunggay lotion that carries multivitamin-content but I prefer not to because of my skin asthma. I'll definitely give this product a try. I know it. One day someone will develop some beauty products out of malunggay. Though i wonder if this is a pinoy brand?